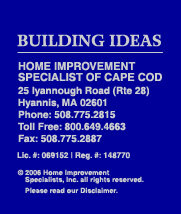 Home Improvement Specialists of Cape Cod, Inc. is dedicated to providing our clients with the highest level of customer service, quality products and skilled craftsmanship. We offer consultation on any remodeling project and include building elevations and plans on all of our work. We maintain a detailed checklist to ensure your home is constructed within our rigorous performance standards. Many of our products have a manufacturer's warranty along with our own limited warranty. Home Improvement Specialists of Cape Cod is committed to making remodeling your home stress and hassle free. We obtain all building permits, schedule all inspections, and adhere to all local, state and federal codes and regulations. We are proud of our repeat customers and large referral business. REFERENCES are available on all our work. We are committed to our customer's care long after the project is complete; whether it's to simply fine-tune any needed adjustments or answer a question. Our dedication to customer satisfaction never ends and that is what sets us apart from our competition.